1. Alejandro Pena-Esclusa has been publicly denouncing Chavez’s ties to the Colombian narco-terrorist group FARC for the past 17 years. 2. Pena-Esclusa runs a platform, which includes 200 Latin American NGOs (UnoAmerica), whose objective is to promote democracy and freedom in the region and to stop the advance of Chavez’s “XXI Century Socialism”. 3. 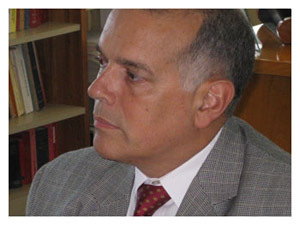 In September 2009, former Venezuelan presidential candidate and leader of UnoAmerica, Alejandro Pena-Esclusa, flew to Washington and informed The Inter American Human Rights Commission (IAHRC) that he was a victim of a fierce judicial persecution by the Venezuelan government. The document was handed personally by Pena-Esclusa, was sealed as received by the IAHRC, and it can be found in the Commission’s archives with the number P-1089-09. 4. During the past ten years Venezuelan government has been trying to discredit Pena-Esclusa through State managed media, resorting to all kinds of unsubstantiated fabrications and slanders. 5. On June 11, 2010 Peña Esclusa underwent a surgical intervention to remove a prostate cancer. 6. On July 1, 2010 Salvadoran alleged terrorist Francisco Chavez-Abarca was apprehended at the Caracas international airport. http://fuerzasolidaria.org/?p=4342) according to which Chavez-Abarca purportedly said that he came to Venezuela to meet with Pena-Esclusa. But the report was not signed by Chavez-Abarca, nor by any other official, attorney or witness. The report presents numerous irregularities and inaccuracies. In addition, Pena-Esclusa was not physically able to meet with Chavez-Abarca because he was still convalescent from his cancer surgery. 9. On July 11 the weekly “La Razon” published a note informing that “in the coming hours” Pena-Esclusa’s house would be subjected to a raid by SEBIN forces. 11. 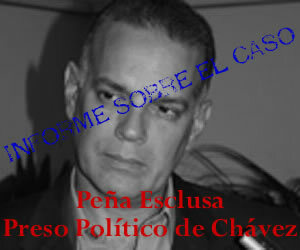 Pena-Esclusa has been more than 10 months in prison, without medical treatment, in spite of his cancer.